Some may think that glossy, tacky apples are covered with artificial wax. This is wrong. 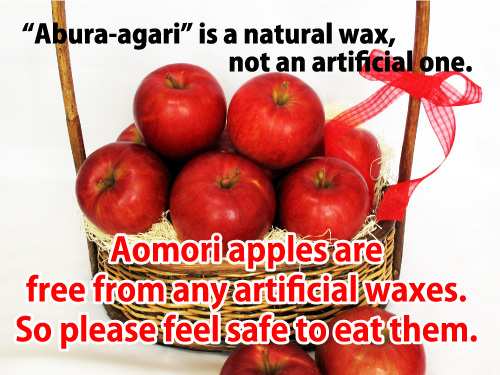 It’s not artificial, but a natural wax that we call “Abura-agari” in Japanese. What are the components of this tacky substance? The apple surface is naturally covered with a smooth and transparent wax film. As the fruit ripens, fatty acids such as linoleic acid and oleic acid are secreted from the epidermal cell. These acids dissolve the wax component, and thus the surface becomes tacky and glossy. It actually indicates the ripeness of the fruit. 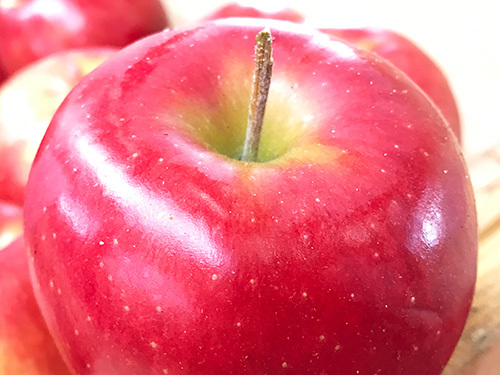 Why do apples produce this natural wax? The natural wax plays an important role in protecting the apple’s high water content and to prevent the infestation of germs. These natural functions keep the fruit fresh. Is it safe for human consumption? Since it is of natural origin, it is safe to eat the wax. The linoleic acid and the oleic acid are types of *unsaturated fatty acids and said to have a rich nutritional value. Does “Abura-agari” appear on every apple? It depends on the variety of apple. It’s often seen among “Tsugaru” and “Jonah Gold” varieties. ⇒　Click here to go to the site.